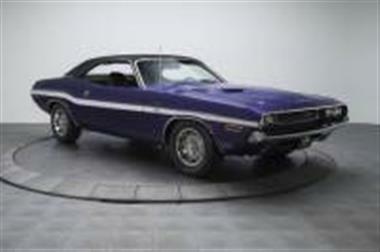 1970 Dodge Challenger in Charlotte, NC for sale. SUMMARY</p>The beneficiary of a ground-up restoration that was completed around the year 2000Correct 426 cubic inch Hemi V8 / Correct dual-quad carburetionCorrect A833 4-speed manual transmissionCorrect Dana 60 Super Track Pak rear axle / Correct 4.10 gearsAll-original sheetmetal / Correct Plum Crazy Metallic paint / Correct R/T stripesCorrect Black vinyl top / Correct Black vinyl interiorSale includes: An MMC Detroit/David Wise Vehicle Inspection Report / Copies of the cars original Broadcast SheetsCorrect power front disc and rear drum brakes / 15-inch Rallye Wheels1 of only 137 Hemi/4-speed Challenger hardtops built for the 1970 model year<p>Its funny how through years of fans and enthusiasts certain automotive terminology tends to build its own appeal. 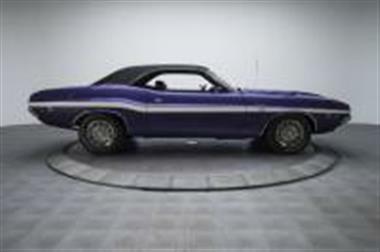 For example in most gearheads minds the term Plum Crazy recalls one of Chryslers most creative and confident eras. 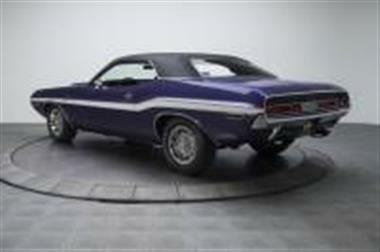 R/T short for Road/Track invokes visions of muscle cars prowling small town streets. Dana 60 or Super Track Pak incites visions of late-night stoplight brawls and octane-fueled quarter-miles. And who could forget Hemi the incredible V8 that led Chrysler through an era of epic performance. 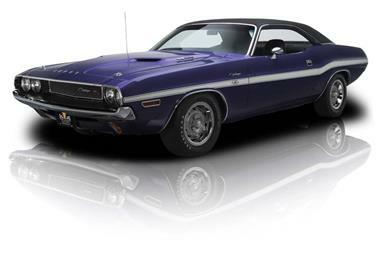 Well our latest top-notch MoPar funnels all of those appealing attributes in to one exclusive investment grade classic. 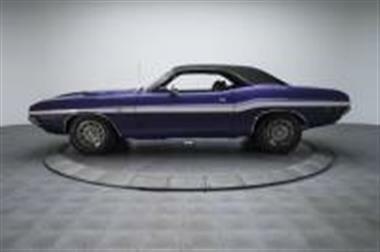 Thats right its a documented authentic Hemi/4-speed Challenger R/T that seals a correct Super Track Pak chassis in correct Plum Crazy Metallic paint. Looking for some first class Chrysler muscle? 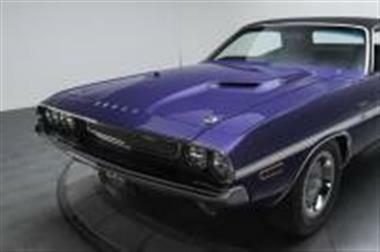 Look no further!</p><p>BODYWORK/TRIM</p><p>The beneficiary of a detailed restoration that was completed sometime around the year 2000 this spectacular Hemi-powered Challenger has been lovingly massaged into a better-than-new show stopper. During that acute rebuild the cars all-original body was stripped to bare metal coached into shape and thoroughly block-sanded into virtually flawless surfaces. Once those surfaces were completely clean and fully prepped a spectacular coat of correct Plum Crazy Metallic 2-stage was buffed to a wet looking shine. And today this clean Dodge rolls as one super slick brute that according to a 2015 Vehicle Inspection Report conducted by David Wise of MMC Detroit carries an appraised value of $240K!</p><p>Given its resurgence in popularity no doubt aided by the current LC-based version the Challenger is considered by some to be the quintessential American muscle car: a status that naturally invokes an aggressive and exciting aesthetic. 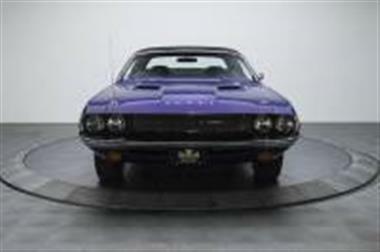 At the front of this Chally a 1970-exclusive grille hangs a brash Challenger R/T badge between pristine headlights amber parking lamps and a mirrored bumper. Behind that grille a pinned Hemi-branded hood props bold D O D G E lettering in front of clean glass that is framed in correct stainless and capped by correct vinyl. At the sides of that hood a sculpted profile hangs correct R/T stripes amid fresh rocker trim flush door handles a correct mirror and ornate Challenger scripts. 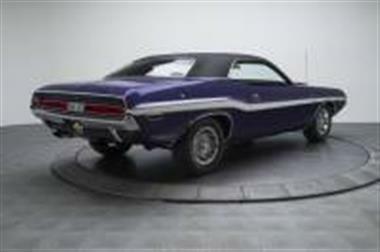 And at the back of the car a stainless-trimmed valence centers body-width taillights and more D O D G E lettering between a second Challenger R/T badge a second mirrored bumper and correct quad-outlet exhaust tips.</p><p>ENGINE</p><p>Toss this coupes light hood and youll find a legendary 426 cubic inch Hemi that while not original to the car is a date-correct piece. As Dodges top option for power hungry gearheads Chryslers legendary elephant block utilizes cast iron heads an oversquare bore a forged steel crank forged steel rods forged aluminum pistons and a hydraulic cam to twist stout 10.25 to 1 compression into a stated 425 horsepower and 490 lb./ft. of torque. All that high performance hardware spins in a glossy Hemi Orange block thats dotted with attractive Organisol-coated valve covers. A perfect mixture of fuel and air is supplied by correct Carter carburetors and a correct aluminum intake. Compression is sparked by high quality Chrysler Electronic Suppression cables which are snapped onto a correct points distributor.